This chair came together as a happy accident. Last spring while shopping at Ikea, I bought a molded plywood seat (w/o legs) cheap from the scratch and dent department. I had started mulling over how to transform it into a rocking chair when, just a few days later, I found an repro Eames rocker base (w/o seat) for sale on Craigslist. Amazingly, the curved profile of the seat compliments the geometry of the base very well and makes for a very comfortable chair. 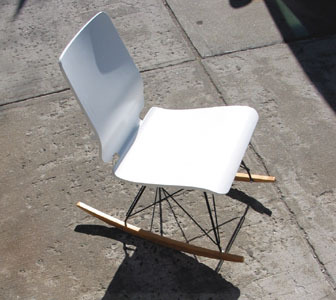 It supports your back higher than the molded fiberglass Eames shell and lets you assume a less upright position.